A Call to Action, often abbreviated as "CTA" in the marketing and business world, is defined by HubSpot as "an image or line of text that prompts your visitors, leads, and customers to take action. It is, quite literally, a 'call' to take an 'action.'" You can see them on websites for just about any product these days, and service-based businesses are really starting to see the benefits of using them, too. Anytime you see a request to sign up for something, share information or pass along a link, you are being called to take an action by the business or organization whose site you're visiting. Now, you may not immediately see how a call to action could benefit you in your freelance business. I get it. I used to think that way. It can be uncomfortable to sell or market our services, but as business owners, we have to. So, we might as well do it well, right? I realized that what a good friend once told me is quite true: "Everyone is selling something these days. We just have to be ourselves and be authentic with how we share it." So true. Most of us with a website hope that our site visitors will see something that makes them want to hire us for an upcoming project or assignment, right? Of course. So, it's not really unheard of to ask a prospective client to do something these days when they land on our websites. Even if they're not yet ready to send us a project, we know that they could be one day. And so, we want to hold on to their information if we can. We want to have a way to be able to reach out to them to start a conversation and to nurture the potential client/provider relationship if there is one to be had, right? Yes. 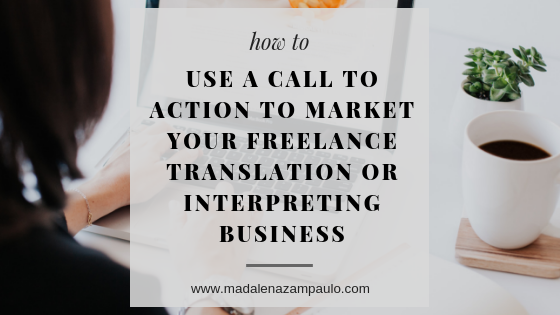 So, how do we create an authentic call to action as freelance translators and interpreters that doesn't make us feel like a used car salesman? First, we have to be clear on what we want our site visitors to do. People like to be told what to do next on a website. Besides making sure your website's navigation is incredibly user-friendly, it is important to make a specific CTA so that anyone who is looking for more information knows what to do next. 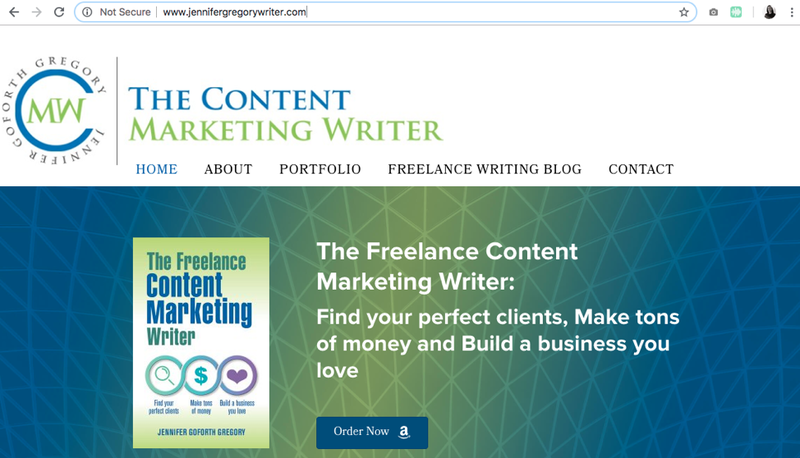 Here are a few examples from freelance writers in whose CTAs are both authentic and provide value. If you ask me, that's the magic formula to any solid CTA that brings results. This first example asks a single question and gives the reader some possible answers that could match what they're looking for. Each answer has a hyperlink that leads to a page where they can find out more about the writer's services. The next example is an offer the writer makes in exchange for a prospect's email address. She's giving value (Insider tips in your inbox every Thursday) in exchange for contact information. This is a great way to build an email list and is worth considering. And finally, this last example is a call to action to buy the writer's new book. The call to action is front and center on her website. And it's very clear what the site visitor should do next. Each of these examples is from a freelance writer who specializes in a different area of expertise. None of them are in-your-face salesy in my opinion. And all of them provide value in their own way. 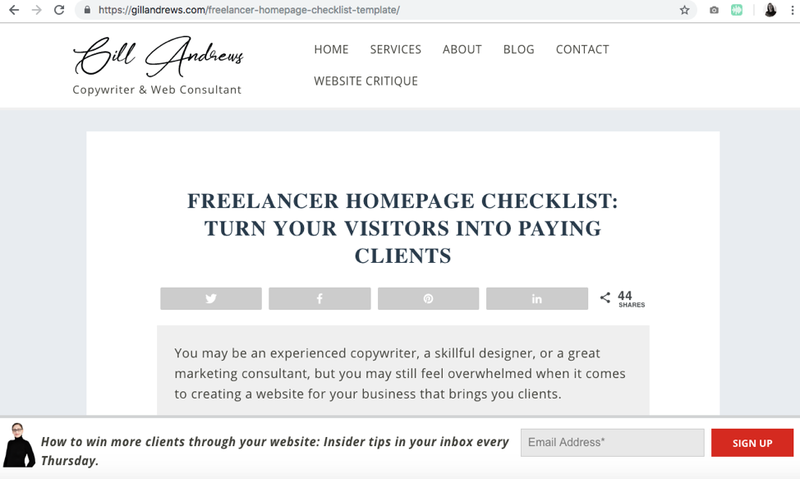 Now that you've seen some great examples from other freelance service providers who also work with words for a living, you may be thinking, "What kind of CTA could I use on my website to bring about results and provide value to potential customers?" Well, first you have to really know your audience and what they are willing to do and tolerate. If your target market is used to seeing pop-up ads asking them for their email address to receive a monthly newsletter, you could try that. But my guess is that most of us work for clients who are not fans of unexpected pop-ups. I know I personally dislike them, so it would feel very inauthentic for me to use one. Instead, I would prefer to share something with them in exchange for their information. Something that not only gives the prospective client some valuable information (a win for them! ), but it allows me to capture their information with the assumption that they may one day have interest in working with me (a win for me!). A mutually beneficial relationship and a well-planned CTA are more likely to work, and there are many ways you could start a relationship with a prospective client by having a solid CTA that still feels authentic to you and is transparent for your clients. If you are considering adding a CTA to your website, I would encourage you to get creative with it! If you are a court interpreter, you could provide something that you know your legal clients would particularly find useful. If you are a translator who prefers to work with agencies, you could do the same thing by knowing what a project manager might find helpful. Before you create your CTA, ask yourself these questions. ● Do you prefer to work for direct clients, agencies, both? Many of us work for both direct clients and agencies, which are two very different audiences. It might be worthwhile to think of separate CTAs for these audiences, or you could settle on just one that is attractive for both. You could get creative with it, or you could go for the simple (but still effective), "Should we connect?" button that leads to your Contact page. Whatever you do, make sure the CTA fits your audience and their needs. ● What do you want your site visitors to do when they land on your website? This is probably the most obvious -- and also the most important -- question to ask yourself. Do you want to capture someone's email address so you can follow up with them? Do you want them to call you to discuss their next project? Do you want to send them to your blog to read some of your original content that shows off your expertise? CTAs don't have to be fancy. They just have to work. So, if all you want is for someone to click to another page of your website to learn more about you, then make this clear and obvious. ● How can you give them what they want quickly and seamlessly? As I already mentioned, clear navigation is vital for any website. But so is a clear and seamless CTA. If possible, try to place your CTA above the fold (i.e., visible from the moment one lands on the web page before having to scroll down to read more). If you have a link you want someone to click on to read more or to contact you, make sure the CTA is in a prominent place on your website. After all, the amount of time you have to capture someone's attention is very short, so make good use of the space (and time!). So, how do you strategically use a CTA to gain more work? The key to converting prospective clients is showing your value first and foremost. Think about serving before selling. I always try to provide value before making a sale. I want my clients to trust me and to trust that I know what I'm doing. So, you will never see me ask them for something up front without giving them something even better in return. Try to think like this anytime you create a CTA for your website. If you simply want to have a conversation with a prospective client, then frame your CTA around setting up a call with them to discuss their project or answer their questions.. When you talk to them, provide valuable information that they could use even if they decide later to hire someone else. A good call to action will provide value and eventually lead to a sale. Of course, it may take time to reach the sale, but this is also true of many networking and sales strategies. And finally, if I can leave you with one bit of advice about CTAs and value, it is this: Always overdeliver. On my small agency website, we provide value by offering our new e-book to those who wish to join our mailing list. We email clients once a month with information about the T&I industry that is applicable to them, and we also share our own news, blog posts, etc. In exchange, we offer them a free copy of our new e-book. We have taken a lot of time to put this together, and we know the information in it is useful. Perhaps next year we will change the CTA to something else, but for now, this one works quite well and prospective clients receive something valuable right from the start, as well as every month in their inboxes. Hopefully by now I've convinced you that having a CTA is a useful marketing strategy. It doesn't have to feel slimy or “salesy”. It's smart. And you can do it in a way that still feels authentic to you and captures your website visitors so that you can start to grow a business relationship with them.